Timestorm, the children’s audio fiction series Michael and I are producing through Cocotazo Media, launches next month. We’ve had a blast recording the first five episodes. The cast is incredibly talented – and it includes many dear friends and family members! When twelve-year-old twins Alexa and Beni Ventura are sucked into an inter-dimensional portal, they meet a distant cousin who presents them with an incredible mission: travel through time to uncover hidden moments from their culture’s past. Along the way, they meet people from Africa, Europe, and the Americas who have left their mark on Puerto Rican heritage…only their names aren’t found in history books. In the twenty-first century, Alexa and Beni navigate middle school, friendship, and home life while keeping their time-traveling pursuits secret. When a natural disaster devastates islands across the Caribbean, the twin’s come to understand just what’s at stake for their ancestral home. As Puerto Rico faces an uncertain future, Alexa and Beni do all they can to witness, find, and remember its past. You can subscribe now on PlayerFM or Radio Public. Links for Apple Podcasts, GooglePlay, and Overcast coming soon. I also had a couple of short scripts, Martina and the Musician and Crap, produced by Cocotazo Audio Theatre. Martina and the Musician has been nominated for a few Audio Verse Awards: Audio Engineering (Michael Aquino), Writing (Me! ), and Production. You can check out all of the amazing shows in the AVA nominee showcase and then vote for your favorites in the first round here. And, finally, publication update! The 7th Grade Sleuths Book #2: Ignacio in the Dark (Overdue Books, 2019) is coming this winter! Check back soon for more details and a cover reveal. I'll be taking part in Step1 Theatre Project's Artists United for Puerto Rico, a benefit performance of poetry, music, and theatrical pieces. An excerpt from my play Hielo will be featured along with other theatre pieces by Nelson Diaz-Marcano and Desi Moreno-Penson, music by Aquino and Tanya Perez, and poetry by Maria Aponte, Isabel Pask, and Richard Perez. The event will take place on 11/13 at 7pm at The Physics Theater (Times Square Arts Center). There'll be a post-show reception with a live DJ, Coquito Bar, giveaways and a silent auction. All proceeds from the evening will go toward direct relief efforts and distribution of goods on the ground in Puerto Rico. Tickets $20, purchase here. Can't attend, but want to donate? Go here. For more information on how you can donate and for resources about Hurricane Maria relief and recovery visit this page I've created. 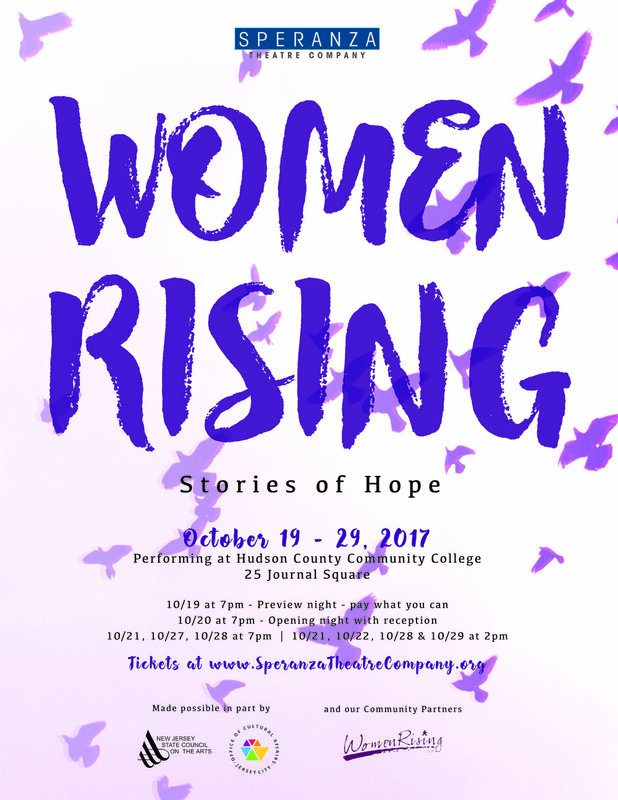 This month also marks the return of Women Rising: Stories of Hope produced by Speranza Theatre Company. It runs through 10/29 at Hudson County Community College in Jersey City. You can purchase tickets and find details here. From Speranza: "WOMEN RISING, Stories of Hope, is a 75-minute original play created by Speranza Theatre Company with the help of our community partner WomenRising.org. Directed by Mikaela Kafka, featuring original music by Drama Desk Nominated composer Estelle Bajou, WOMEN RISING is a compilation of stories written by 7 playwrights under the guidance of lead writer, Jennie Contuzzi." Recommended for ages 15+. Wheelchair accessible. Next month I’ll be participating in the Puerto Rican Book Expo on Saturday, November 19 from 12:00-7:00pm at Hostos Community College, 450 Grand Concourse in the Bronx. Comité Noviembre sponsors this annual event held in conjunction with the National Puerto Rican Artisan Fair and Exhibit. Come get an early start on holiday shopping while showing your support for local artists and authors! The mini-tour of a new version of Mi Casa Tu Casa kicks off this Saturday, 3/1 at 11am at Luna Stage. It's presented as part of the 2014 New Jersey Stages Festival with generous support from the New Jersey Theatre Alliance and the HMS Foundation. Luna will host another show on 3/8 at 11am. The other venues are Abington Avenue School in Newark, NJ (3/7 @ 6pm) and the Institute of Music for Children in Elizabeth, NJ (3/22 @ 3pm). March 1 & 8, 11am: Luna Stage, 555 Valley Rd, West Orange - Adults $8, children 12 & under free (limit 4 children per adult). | March 7, 6pm: Abington Ave School, 209 Abington Ave, Newark - Adults $2, children free. | March 22, 3pm: Institute of Music for Children, 780 Salem Ave, Elizabeth - $6 adults, $4 children 12 & under; Institute Members $3.00 Adults, $1 children 12 & under. For tickets to all dates visit: www.stagesfestival.org.